Rome is a city built upon layers and layers of history, and in few places is that more evident than at the Basilica di San Clemente, located near the Colosseum. A somber-looking church and residence for priests studying in Rome, San Clemente is surrounded by a tall, nondescript wall and bears a small, simple sign at the entrance. In fact, it would be easy to walk right past and in doing so, miss one of the most important underground archaeological sites in Rome. Step inside San Clemente's humble doors and you'll be dazzled by an ornate 12th-century Catholic church, with a gold mosaicked apse, gilded and frescoed ceilings, and inlaid marble floors. Then descend downstairs, to a 4th-century church containing some of the earliest Christian wall paintings in Rome. Beneath that are the remains of a 3rd-century pagan temple. There are also remains of a 1st-century residence, a secret Christian worship site, and the Cloaca Maxima, the sewer system of ancient Rome. To understand the complex architectural and archaeological history of Rome, a visit to San Clemente is a must. The history of the Basilica is long and complicated, but we'll try to be concise. Deep under the site of the present day basilica, water still rushes through an underground river that's part of the Cloaca Maxima, the Roman sewer system built in the 6th century B.C. You can see the running water in a few places and hear it in most parts of the excavation. It's a mysterious sound that goes well with the dark, slightly eerie ambiance of the underground. Also well under the present church once stood Roman buildings that were destroyed by the great fire of A.D. 64, which devastated much of the city. Soon after, new buildings went up on top of them, including an insula, or simple apartment building. Adjacent to the insula was a grand home of a wealthy Roman, considered by the church to be an early convert to Christianity. At that time, Christianity was an outlawed religion and had to be practiced in private. It is thought that the owner of the house, Titus Flavius Clemens, allowed Christians to worship here. Several rooms of the house can be visited on the underground tour. In the early third century (from A.D. 200) in Rome, membership in the pagan cult of Mithras was widespread. Followers of the cult worshipped the god Mithras, whose legend is thought to be of Persian origin. Mithras is frequently depicted slaughtering a sacred bull, and bloody reenactments involving bull sacrifices were a central part of Mithraic rituals. At San Clemente, a portion of the 1st-century insula, which presumably had fallen out of use, was converted to a Mithraeum, or cult sanctuary. This place of pagan worship, including the altar where bulls were ritually slaughtered, can still be seen in the basilica's underground. With the 313 Edict of Milan, Roman Emperor Constantine I, himself already a convert to Christianity, effectively ended the persecution of Christians in the Roman Empire. This allowed the religion to firmly take hold in Rome, and the cult of Mithras was outlawed and eventually dissolved. It was typical practice to build Christian churches on top of former pagan places of worship, and that's exactly what happened at San Clemente in the 4th century. The Roman insula, the presumed house of Titus Flavius Clemens, and the Mithraeum were all filled in with rubble, and a new church was built on top of them. It was dedicated to Pope Clement (San Clemente), a 1st-century convert to Christianity who may or may not have actually been a pope and may or may not have been martyred by being tied to a rock and drowned in the Black Sea. The church flourished until around the late 11th century. 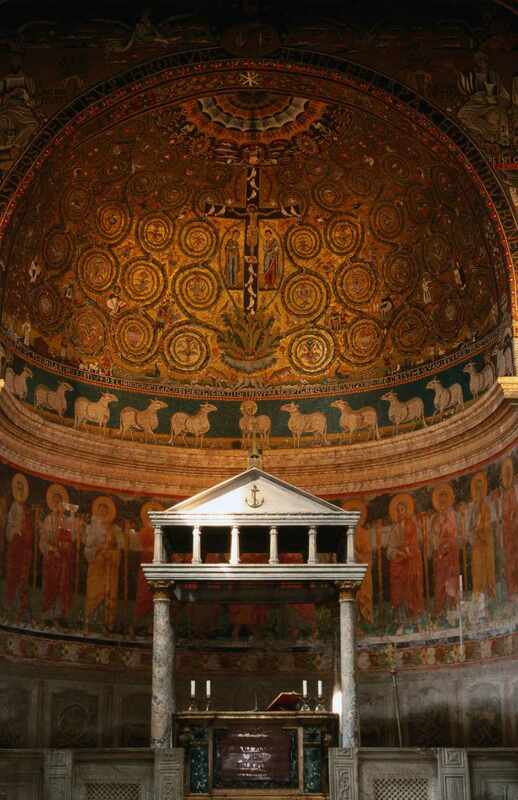 It still contains fragments of some of the oldest Christian frescoes in Rome. Thought to have been created in the 11th century, the frescoes depict the life and miracles of Saint Clement and can be viewed by visitors. By the early 12th century, the first basilica was filled in, and the current basilica was built on top of it. Though comparatively small next to some of Rome's grander basilicas, it is among the most ornate in the Eternal City, with gilding, glittering mosaics and intricate frescoes. Many visitors barely glance at the church before heading right to the underground—they're missing out on a veritable jewel box of ecclesiastical art. A trip to the Basilica di San Clemente is easily combined with a visit to the Case Romane del Celio or the Domus Aurea, both equally fascinating underground sites. Keep in mind the afternoon closures at San Clemente, and plan to arrive before noon or after 3 p.m. Hours: The basilica is open Monday to Saturday from 9 a.m. to 12:30 p.m., and again from 3 p.m. to 6 p.m. Last entrance to the underground site is at 12 p.m. and 5:30 p.m. On Sundays and state holidays, it's open from 12:15 p.m. to 6 p.m., with last entrance at 5:30 p.m. Expect the basilica to be closed on major religious holidays. Check their Facebook page for schedule updates and changes. Admission: The upper church is free to enter. It's €10 per person to go on a self-guided tour of the underground excavations. Students (with valid student ID) up to 26 years of age pay €5, while children under 16 enter free with a parent. The admission fee is a little steep, but ultimately it's worth it to see this unique part of underground Rome. Rules for visitors: Since it's a place of worship, you need to dress modestly, meaning no shorts or skirts above the knee and no tank tops. Cell phones must be turned off and photos are absolutely not permitted in the excavations. The Basilica di San Clemente is located in Rione i Monti, the neighborhood of Rome known simply as Monti. The church is a 7-minute walk from the Colosseum. Entrance and access: Although the address is Via Labicana, the entrance is actually on the opposite side of the complex, on Via San Giovanni in Laterano. Unfortunately, neither the church nor the excavations are wheelchair accessible. Access to the church and underground are via steep flights of stairs. Public Transportation: From the Colosseo Metro station, the basilica is an 8-minute walk. It's a 10-minute walk from Manzoni station. Trams 3 and 8, as well as buses 51, 85 and 87 all stop at the Labicana transit stop, about 2 minutes' walk from the basilica. If you are already exploring the Colosseum and Forum area, it's most practical just to walk to the basilica.